Speakers will discuss the national security dimensions of global food insecurity. Sept. 12, 2018, AUSTIN, TEXAS – Two of the country’s leading experts in national security will discuss the security dimensions of global food insecurity during an upcoming forum at the LBJ School of Public Affairs at The University of Texas at Austin. 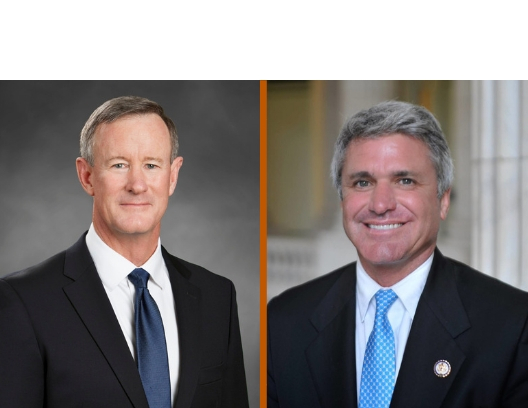 Admiral William McRaven, former UT System chancellor and new LBJ School professor, will join U.S. Rep. Michael McCaul (R–TX) for a conversation on food insecurity as a destabilizing factor in countries important to U.S. national security. Chris Tomlinson of the Houston Chronicle will moderate. The event will occur on Sept. 17 in Bass Lecture Hall from 5:15 PM – 6:45 p.m. Registration is required. Food insecurity is a national security priority. Issues such as displacement, refugee crises, human rights violations and terrorist threats can arise from food insecurity. Listen to Admiral McRaven discuss failure, trust and purpose on LBJ's podcast, "Policy on Purpose"
The event is co-sponsored by the LBJ School of Public Affairs, Robert S. Strauss Center for International Security and Law, Clements Center for National Security and Innovations for Peace and Development. In recent years, research from the LBJ School has shed a light on food insecurity both locally and globally. For example, LBJ School professors Raj Patel and Erin Lentz recently led a policy research project on food insecurity in Austin, finding that 25 percent of Austin households are food insecure. Lentz also conducted recent research on the intersection of food insecurity and domestic violence among women in rural Bangladesh. Contact the Office of Student Affairs and Admissions to learn more about student research opportunities. The LBJ School, one of the nation’s top public affairs schools, makes a difference, not only within the walls of academia, but also in the public and social dialogue of the world. Contributing viable solutions to society is the LBJ School’s legacy and its benchmark. Its effectiveness in channeling the purpose and passion of students into professional careers is evident in the success of more than 4,000 graduates who are the living legacy of President Johnson’s bold and fearless action. For more, visit http://lbj.utexas.edu.